Prominent & Leading Manufacturer from Mumbai, we offer inspection doctoring rewinding machine and 3 drive slitting rewinding machine. 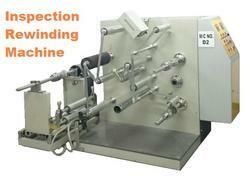 We offer optimum quality Inspection Doctoring Rewinding Machine to our prestigious customers. Manufactured in compliance with the industry set standards, the offered machine is widely used for controlling the quality of different printed substrates. The offered machine is highly demanded in the market for its sturdy construction, hassle free installation and optimum performance. We are among the leading manufacturers and exporters of high quality 3 Drive Slitting Rewinding Machine. The offered machines are equipped with fully automatic control panels that control and regulate various operations such as winder drive, trim collection blower operation and speed indication. With our well connected distribution network, we deliver these machines within the fixed time frame. Price Ranges from: 12 to 15 Lakhs. Air expanding shafts suitable for 76 mm core ID is provided. Max Unwind dia: 1000 mm. Max Rewind dia: 400 mm. Min. Slitting Width: 25 mm.